I couldn’t let this week go by without a Jubilee mention. Queen Elizabeth II has reigned for 60 years – a milestone the world will most likely never see again. I love it how all the longest reigning monarchs of England have always been women (Elizabeth I, Victoria, Elizabeth II). England is a flutter with Jubilee fever. There are Union Jacks everywhere, in every store and and window display. Pubs have got Jubilee menus on offer and Harrods has got silver plated commemorative gifts. 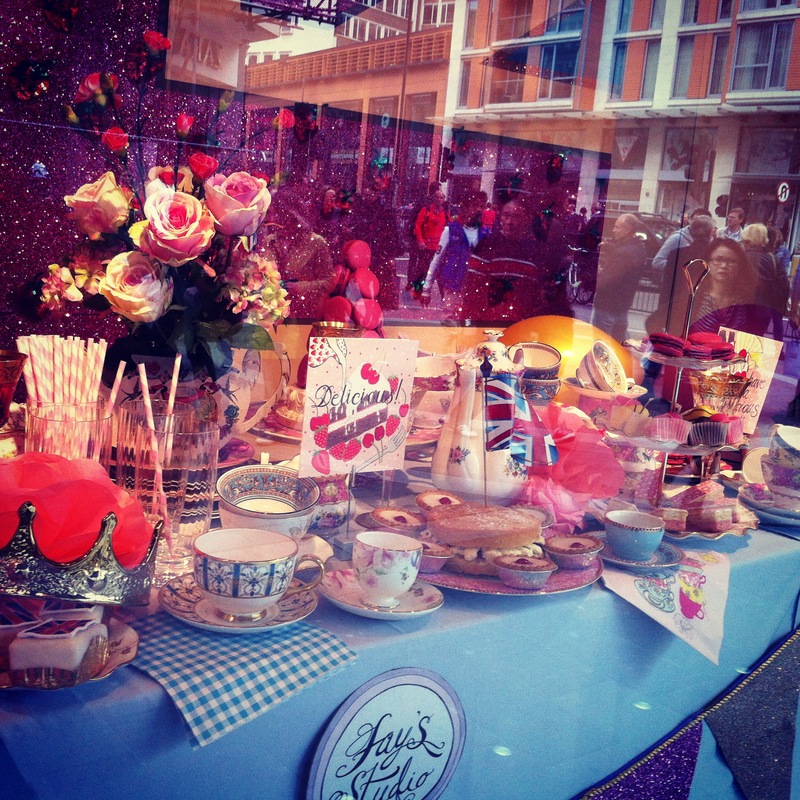 I was in Harrods recently and was thoroughly impressed with their window displays. I didn’t get around to seeing Selfridges, but I am sure it was amazing. I’ve got my bunting and picnic preparations underway. 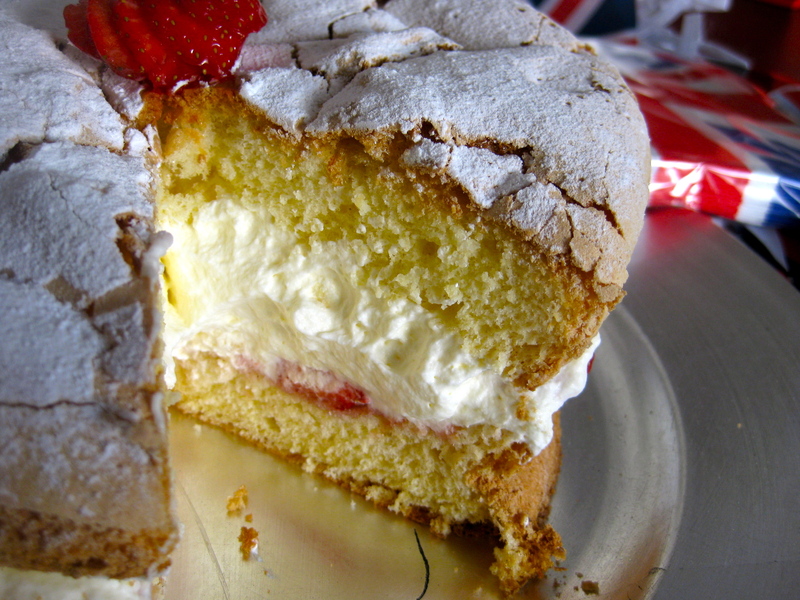 I’ve been experimenting with sponge cakes this week so I can be confident that come Jubilee picnic on Saturday – I am not showing up with a stodgy slab of something not worthy of being called a sponge. I’m going off some simple, old fashioned recipes from my Edmonds cookery book. The first one I tried was fine, but not as light as I wanted. The second one, used only a half a cup of cornflour and has turned out just right. Although I did leave it in the oven for a little too long so it is slightly over cooked. My red, white and blue decorations will be spectacular. In the meantime, we’re finalising what to bring to our little picnic. VC is making cupcakes and sandwiches. She makes the best waldorf chicken finger sandwiches. I am sure someone will be bringing some Coronation chicken. While I would love to see the Golden carriage carrying QEII down the streets of London, I just don’t think I am prepared to battle the crowds. Trying to see the changing of the guard on the best of days is a struggle, I can’t imagine how crazy it will be over the weekend. Dare I say I can remember as a young child the huge street parties we had in June 1953 in Southampton when the coronation took place. I had never seen so much food laid out, as we were still coming out of years of rationing! If it’s one thing the Brits do so well, it’s definitely street parties! Enjoy the celebrations. this talk of sponge cake is making me very hungry. looks delicious Lara and I’ll bet it tasted incredible!